Save time, save money and be confident in the knowledge that your cables were built and tested by WTI's trained production staff. We take pride in offering our customers the highest-quality products that they can count on! Factory built and tested cable assemblies for WTI Sidewinder series cameras and system products. 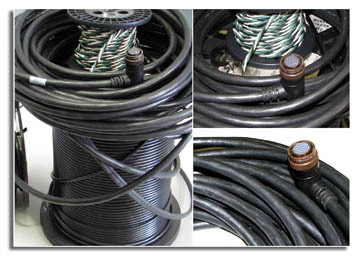 WTI cables are of the highest quality and workmanship; built by trained professionals. The single SWCA cable provides video, data and power. Weatherproof connectors are assembled with quality gold pins for reliable operation in extreme environmental conditions. Buying quality pre-assembled cables minimizes on-site time and saves money on the installation processes. Cable lengths available from 25 to 250 feet. Cables are available in both 120 VAC and 24 VAC power and RS-232 or RS-422 data options. Click HERE to download more information on the custom-built cables for the Sidewinder series of cameras.